We can offer you at no extra cost, Fly and Spin Fishing lessons with one on one instruction until you are comfortable and successful in Fishing. Get the basic principles of Fishing for Trout, Salmon, and Bass. In addition, we offer push-button spin fishing for young children to allow them to get hooked and have the best fun they will not soon forget! We offer full single day trips as well as multi-day trips for ice fishing! We offer full, half day trips as well as multi-day trips for open water fishing! Please Take Note on our Land Lock Salmon Fishing in Maine! We offer fishing for the Land Lock Salmon not to be confused with an Atlantic Salmon! We primarily fish for Inland species of freshwater fish here in Maine. Maine is comprised of many glacier deposit type lakes that hold indigenous cold and warm water species. Some species have been planted here illegally but have made a home here in Maine. Here is an overview of these fish we fish for and their legacy in Maine. Charr in Maine can live up to 15 years and attain a size of about 20 inches and 3 pounds. More often charr is much smaller; in some lakes, the average size is closer to 6 inches and a few ounces in weight. A fish larger than 2 pounds is of significant size. The charr is a slender member of the salmon and trout family. Usually dark on the back, lighter on the belly, and having light spots on the sides. Paired fins are orange to red with a bright white leading edge. The tail is moderately forked. During breeding season, both sexes become highly colored. Coloration can then range from pink to orange bellies, blue to brown backs, and creamy to orange spots. Fin colors can also become very intense during spawning. 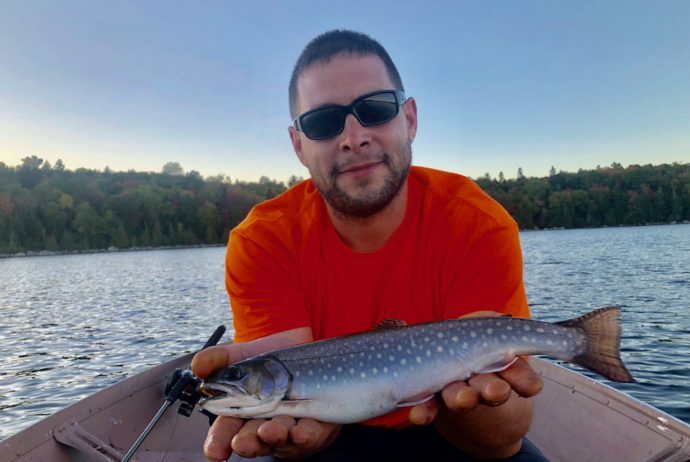 Maine’s Brook Trout 657 lakes and ponds have brook trout populations derived entirely from natural reproduction, and 311 have NEVER been stocked, representing genetically pure strains, unaltered by man since the glaciers retreated. Maine is virtually alone in the Northeast in having maintained a substantial part of its native brook trout heritage. 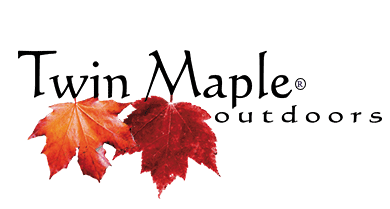 We here at Twin Maple Outdoors treasure and respect this heritage and want to help our area preserve this special resource through education and appropriate conservation practices. Using conservation generates revenue which intern is used to keeping this resource unspoiled for future generations to come. Maine’s Land-Locked Salmon Landlocked salmon are a freshwater form of the sea-run Atlantic salmon. We like to refer to them as a cousin of the Atlantic Salmon. This is a result of the deposits of the reseeding oceans from when Maine was covered with a sheet of ice. Prior to 1868, landlocked salmon populations occurred in only four river basins in Maine: the St. Croix, including West Grand Lake in Washington County; the Union, including Green Lake in Hancock County; the Penobscot, including Sebec Lake in Piscataquis County; and the Presumpscot, including Sebago Lake in Cumberland County. Cathance Lake in Washington County was probably the first Maine lake to be artificially stocked with landlocked salmon. This occurred in 1868, using salmon eggs obtained at Grand Lake Stream the previous year. Today, landlocked salmon provide the primary fishery in 176 lakes comprising nearly 500,000 acres. They are present and provide incidental fisheries in an additional 127 waters comprising about 160,000 acres. Maine supports one of the largest sports fisheries for this species in the world. Landlocked salmon also provide good fisheries in 44 rivers and streams totaling about 290 miles. Land Locked Salmon was the first game fish species to be disseminated throughout the state for the purpose of generating a sports fishery. Maine’s Lake Trout (Togue) This cold, deep water fish is one of Maine’s prevalent sports fish that is best caught in colder months of the year. Lake Trout are generally a lazy scavenging fish that is closely related to The Brooke Trout. Lake trout stay in the cold thermal cline deep in a glacier lake where they look for an easy meal. The lake trout is a slow-growing fish and is the largest of the Chars. lake trout commonly reach lengths of 18 to 24 inches and weights of 2 to 4 pounds. They are among the longest-lived and largest freshwater game fish, often living 20 years or more and attaining sizes of over 30 inches and 10 pounds. We avoid fishing for Lake Trout in warmer water months due to thermal shock and unavoidable killing or damage to them. Maine’s Small Mouth Bass Bronzeback, brown bass, black bass, Oswego bass, green trout, and red eye…These fish commonly live 5-7 years, with a few individuals reaching ages from 10-20 years. Our record fish in Maine is 8 pounds caught at Thompson Lake in 1970. Small-mouth Bass has quickly become one of Maine’s best-kept secrets and under fished species in Maine. Although introduced in waters of Maine, this fish has stolen the spotlight with sportsmen visiting here to fish. Fly fishing for small-mouth has taken very large popularity due to the abundance and fight of these fish. Pound for pound you will find these fish to fight like no other especially in Maine rivers where they live and build a resilience form living in a strong current. Maine’s White Fish Fishery Maine’s population of white fish is said to be very prolific due to the number of eggs reared in September and October. This being said, the populations of white perch have dwindled. White was once commercially harvested from Moosehead Lake. Found in only a few select cold, deep, oxygenated glacial lakes in Maine, these fish can grow quite large and are considered slow growing. A three to four-pound fish is said to be around 10 years old or more. Fishing for whitefish lends itself to a remote fishing trip at Twin Maple Outdoors. Traveling to the northern reaches of Maine, the fish are found still in abundance and very much desired as a sports fish and excellent table fare. Whitefish spend their lives in all columns of water but especially near the bottom where they feed on snail and insect larvae. Bigger white fish also feed on smelt and other small bait-fish. Maine’s White Perch Fishery Maine’s population of white perch is said to be an American original. The fish is considered an excellent sports fish and table fare. Dating back to native Indians, the white perch was and has been most revered as a Maine delicacy and treasure of the freshwater fish species. It is said that the white perch had been located originally as a coastal fish closely related to the striped bass. The native Indians were first to spread the species inland as we see it today and populations continue to grow and expand. Either stripped bass or perch can live in fresh, salt or brackish waters. Size can vary greatly according to the type of habitat and the density of the perch population. A 6-year old perch can be anywhere from 6 to 12 inches long. The average 8 to 10-inch perch weighs about 0.45 pounds and is about 4 years old. All Maine perch waters are wild and self-sustaining. Due to the prolific nature of this species, fishery biologist and managers have found no need to supplement perch populations with hatchery-reared fish, and there are no hatchery facilities for this species in Maine. Since the introduction of Pike to the Belgrade Lakes, white perch have grown rather large due to the thinning out of the species, which leads to less competition for the food source. As with any body of water, we at Twin Maple Outdoors, encourage the harvest of these fish by law, as it helps populations from becoming overpopulated and has stunted growth. Maine’s Muskie Fishery Maine’s population of muskellunge originated from an introductory stocking in Lac Frontiere by the Quebec Government around the late 1960s. Lac Frontiere lies at the headwaters of the Northwest Branch of the Saint John River, which provides a travel corridor for musky to access waters in Maine. The life expectancy of musky may approach 30 years, but most fisheries are comprised of 3 to 15-year-olds. Musky is one of the largest game fish found in Maine. In 2007, a State record, 31.02-pound musky was caught in Glazier Lake. Maine’s Pike Northern pike was initially introduced into Maine in the 1970s, as the result of an illegal introduction into the Belgrade Chain of Lakes. Subsequent migration within the Belgrade lakes drainage and additional illegal introductions are responsible for an expanding distribution within central and southern Maine. In many waters in Maine, Pike is considered an invasive species and when caught need to be eradicated by law in specified waters by The State of Maine Inland, Fisheries and Wildlife.